Carriage 44, Take Me Away! Carriage 44 Take Me Away! You know those people who coo at high end soap as if they were meeting their best friend’s newborn. I am almost embarrassed to admit it, but I was just a few oohs and aahs shy of joining that club when Carriage 44‘s beautifully packaged soaps (rose and oatmeal soaps) and lotion (vanilla shea butter cream) arrived. 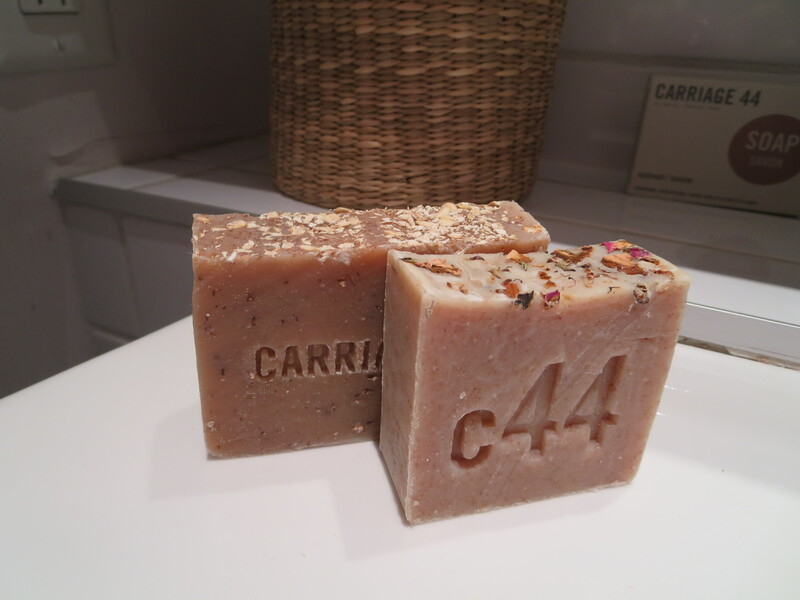 Carriage 44 is a Montreal based-company that produces handmade, natural soaps, lotions, and candles. The company started in 2010 and regularly appears at artisanal bazaars like the SAT Souk and Puces Pop. In addition to running a successful Etsy shop, Carriage 44 products can be found in various boutiques across Canada and online at Cargo.com, Tinder.ca (not to be confused with Tinder.com) and Urban Outfitters.com. One thing Carriage 44 products convey is a sense of luxury, which begins with the packaging itself. 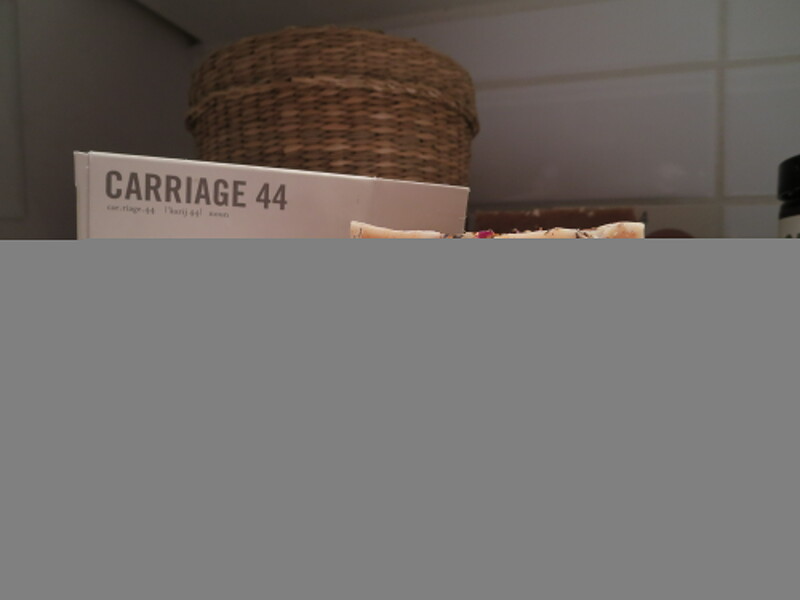 Carriage 44 products are packaged in elegant, minimalist boxes with a clean serif-free font in beige toned colours. Think high-end hotel bathroom or spa ambiance. A true bathroom snob might never unpack the products (a mistake) or cleverly reuse the boxes as part of home decor. A quick perusal of the listed ingredients shows that everything has a plant-base: olive oil, coconut oil, sweet almond oil, rose hip. 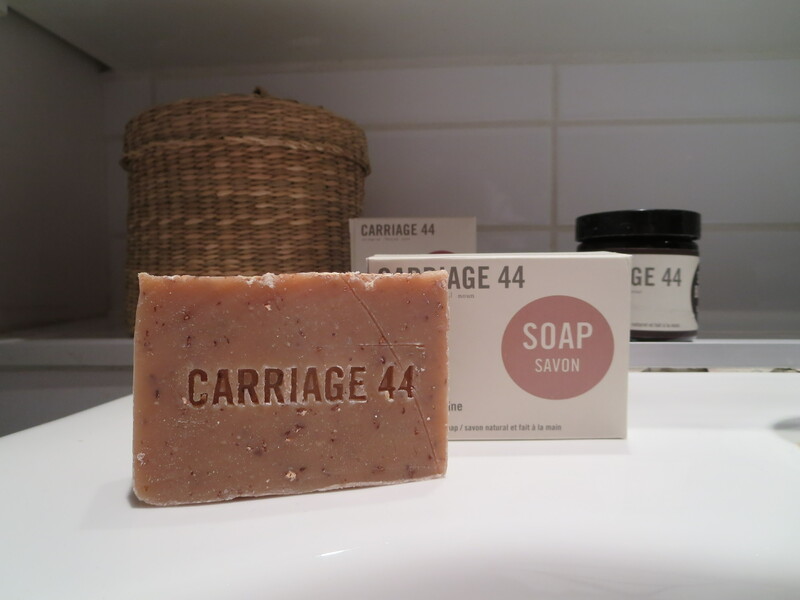 In sum, Carriage 44 ingredients could be used to make soap or a really unplesaant tasting salad dressing. Out of the box, both soaps are eye candy. Fragments of the ingredients within sprinkle the top of each bar. The company stamp appears on the face of each bar. I immediately make note that though both bars of soap have a scent, the scents are neither overpowering nor perfumey. They smell, well, natural and the ingredients within shine through. Understatement beats overstatement when it comes to scenting products. 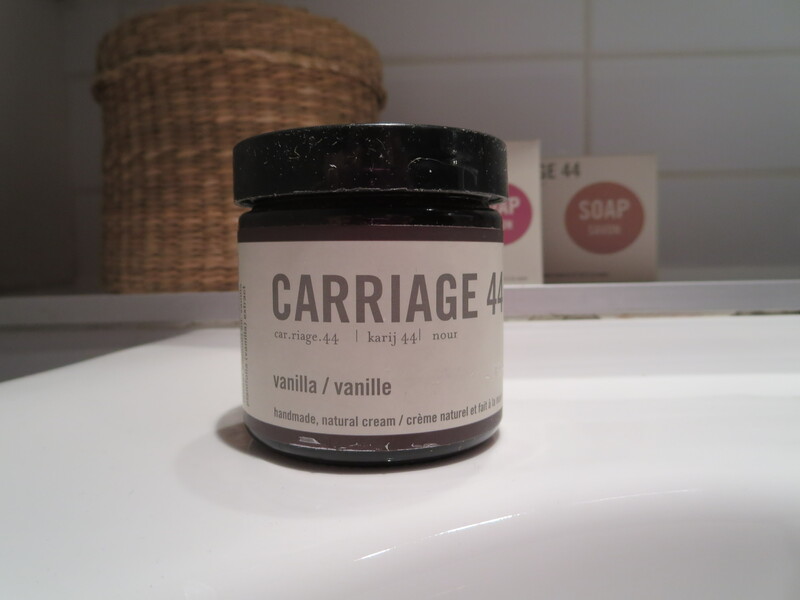 Of course, for those who are sensitive, Carriage 44 offers unscented products as well. The real test, of course, is how well the two bars and my hands mesh. Oatmeal soap is traditionally a drying soap, best for oily skin, while rose soap generally is better for sensitive and dry skin. My hands could be mistaken for that of a reptile. I opt for the rose soap and pass off the oatmeal soap to a more oily-skinned friend for a test. As a bath-and-beauty-product-lover, I’m enamored of the rose soap on first use. It’s gentle, but effective. It produces a slight lather and washes off cleanly with no residue. I can not detect a rose smell on my hands afterwards and I am grateful; I’d rather not smell like a flower shop. Perhaps most important is the fact that the soap doesn’t dry out my skin. The pinkish toned bar is just the sort of everyday indulgence one needs in the final weeks of winter. 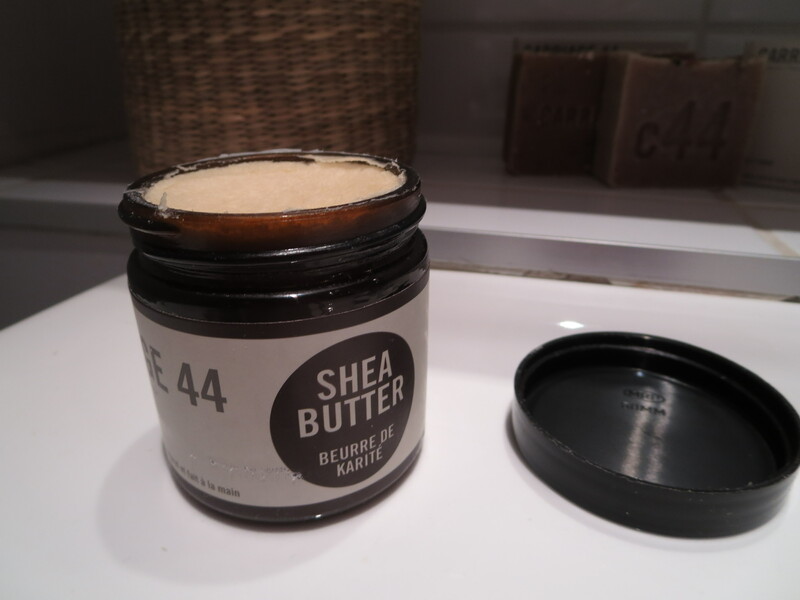 Carriage 44’s care package also contained a 100 mL jar of vanilla shea butter lotion. The apothecary-esque jar uses the same minimalist font and beige tones on its label around a burnt umber brown jar with a black lid. I open the lid to be greeted with the most appetizing scented hand cream ever. It’s vanilla alright, but not the deep musk of the vanilla bean. I’m thinking pillowy vanilla frosting. It’s sweet and vibrant, almost creamy. This is more airy, more playful than I associate with vanilla. The consistency of the lotion reminds me of elementary school paste. It’s thick, not runny in the least. There’s a bit of a grainy-ness to it and it has the consistency of frosting, rather than mayonnaise. It is not oily or viscous, but moves more thickly, like vasoline. It doesn’t sink in right away and I feel it coating my hands. I tell myself to be patient and not touch my phone or computer, so I can allow it to seep into my skin like a skin treatment. 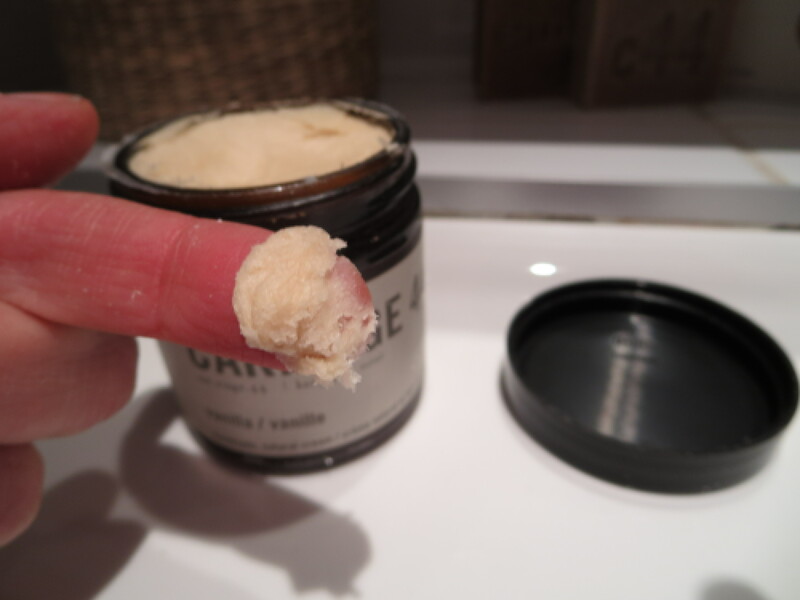 Once the lotion is absorbed, my hands feel buttery and smooth to the touch. The lotioned area feels nourished. Overall, I would recommend the shea butter for extremely dry skin. It’s not so much a lotion as it is a therapeutic product. It’s not the sort of thing one rubs in every 10 minutes or so like a tanning oil. Rather, I would recommend it highly to anyone with problematic dry skin — or even better, for use on over-wintered feet (trust me on this one). With winter refusing to leave, Carriage 44 products provide a taste of spa luxury at home in those final long weeks holed up. Carriage 44 products are available HERE.